For all your shrink wrapping needs, Advanced Document Systems & Supply Inc, offers Shrink Wrap Machines, Shrink Wrap Sealers, and Shrink Wrap Film. Shrink Wrap offers many uses for storing, packaging, or transporting objects and packages such as CDs, printed matter, candles, soap, gift baskets and more. A sturdy plastic film is tightly wrapped around the product. Heat Shrink Wrap Plastic Film will become tight and strong when heat is applied. 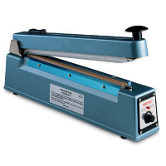 We offer a variety of economical and convenient shrink wrapping machines, including the I Bar Shrink Wrapper and Bag Sealer. These are typically used for low production applications. These Bag Sealers offer a fast, flexible and economical packaging system. Different models will accommodate varying sizes of packaging: 13# model for packaging items up to 20" round, 18" model for items up to 32" around, 24" model for items up to 44" around, and 30" model for items up to 56" around. 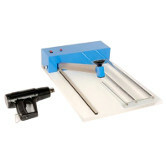 The I Bar sealer will seal the edges in seconds with the heavy-duty heat gun. The bag creates a tight seal and protective casing around your packaging. Further hand sealing and convenience can be had with Bag Sealers. These hand Sealers include two heating elements and two top Teflon covers for a tight seal. These machines require no warm up time, and feature an adjustable timer that automatically alerts the user when the seal is done. This allows the user to adjust for different materials and varying thicknesses. The seals produced can seal up to 12 mil total thickness. We offer four models (TISH-200, TISH-200C, TISH-300, TISH-300C) in two lengths: 8" and 12". The TISH "C" series comes with a cutter for trimming excess material after the seal has been made. Simply slide the cutting lever across the bar for a clean cut.